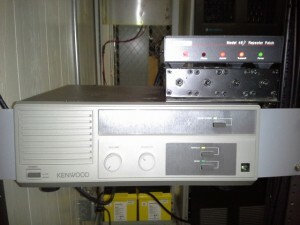 In the short term, the repeater will be on the air at the Mt Hope site. In the longer run, the repeater will be setup to be portable for special events, emergencies, and "family" use. If you're in the Southern Maryland area try it out and see if you can hear the system. 442.900MHz, + offset, CTCSS 156.7Hz. As of 25 September the 442.900 repeater is off the air. It has been replaced with a Yaesu System Fusion repeater on a frequency of 444.950MHz, + offset, CTCSS 156.7Hz.